During the 1947 session, significant and important expansions of election law were enacted, traffic and highway rules and procedures were rewritten, criminal procedure was further made systematic, procedures for licensing and regulation of hospitals were put in place, and a process for the adoption of children was codified. With the Cold War fast becoming the dominant paradigm in geo-politics, Alaska's strategic importance was not diminished and may have increased following the end of World War II. Federal military spending and increased population brought a post-war economic boom to the region; however, the corresponding demands for services created a fiscal crisis for the territorial government. The general operating bill for 1947-1948 authorized $8.48 million in spending, an increase of over fifty percent from that approved in 1945. The Legislature raised the excise taxes on alcohol and salmon, and rewrote mining tax law in an effort to raise additional funds; however, mining in the region was still suffering from the suspension of gold mining during the war, and from reduced demand. Further, although the price for salmon was relatively high due to declines in stocks, the territorial fish tax was based on volume rather than value. As a result, for a time after 1947, alcohol taxes were the Territory's largest revenue source. By the end of 1948, the Territory was fiscally bankrupt. Incensed by what it perceived as gross mismanagement of territorial finances, the electorate punished Legislators at the ballot box the following year, setting the stage for Alaska's first income tax system. The other major political issue of the time centered on the use of fish traps. Long controversial, fish traps were used by canneries and other commercial harvesters to capture massive numbers of salmon at the mouths of significant spawning areas. Alaskans viewed the practice as benefiting wealthy outside interests at the expense of traditional boat-owning fishermen and their families. Although perhaps a footnote to history today, a referendum on the topic placed on the ballot by the 18th Territorial Legislature produced the largest voter turnout to date, with Alaskans voting by an 8 to 1 margin to ban fish traps. 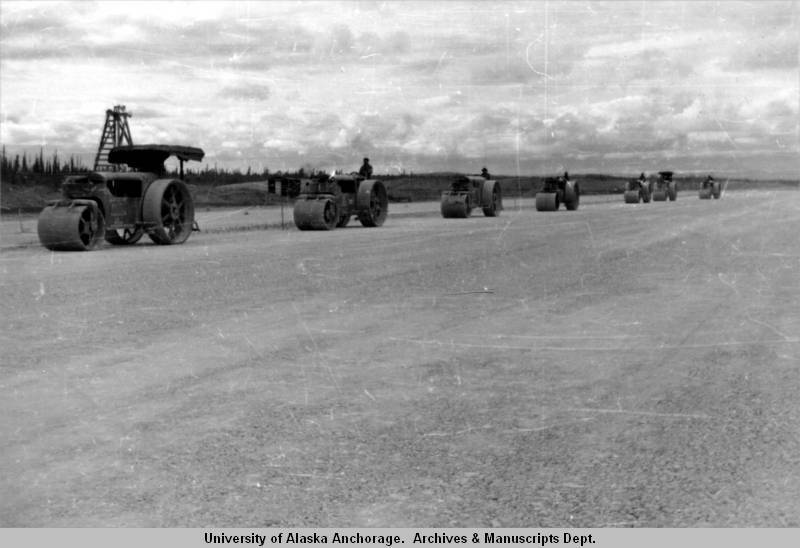 The use of the traps remained controversial and was even an issue in the fight for statehood as well-funded proponents of their use lobbied Congress to maintain the federal government's control of fisheries in Alaska. The first Alaska Native land claims suit is filed in U.S. Court. A former military installation near Sitka becomes Mt. Edgecumbe High School-a boarding school for Alaska Native children. India and Pakistan are granted independence and quickly go to war. The sound barrier is broken for the first time in an aircraft. Mohandas Gandhi, commonly known as Mahatma Gandhi, is assassinated. The "Berlin Airlift" is organized to relieve the Soviet blockade of Berlin.